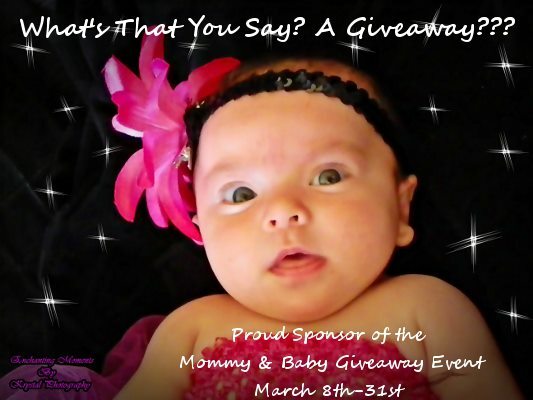 I'm A Silly Mami: Mommy and Baby Event and Giveaway March 8th-31st ATTENTION BLOGGERS!!! Kathleen's Blog Spot is planning a Huge Giveaway for March 8st-31th. The theme of the Giveaway is Mommy and Baby. We are putting two baskets together, one boy and one girl. Every participating blogger will be able to include two URL's on the Rafflecopter for a $5.00 fee. Their Facebook URL and a URL of their choice. The giveaway will be promoted on several sites, blogs, facebook and twitter pages. We would like to get about 25 bloggers to participate and include their readers in the giveaway.